Chimneys are an integral part of most home heating systems. A masonry chimney is composed of several components, each playing an important role in the performance and function of the chimney, regardless of the fuel utilized or the heating appliance that is used. One of the most important and perhaps least understood of these components, is the flue lining. 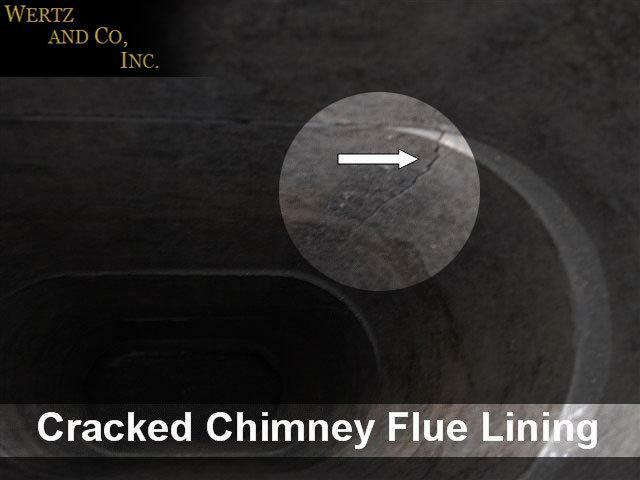 A flue lining of a chimney is defined as A clay, cast concrete, or metal conduit installed in a chimney, intended to contain the combustion products, direct them to the outside atmosphere, and protect the chimney walls from heat and corrosion. As a homeowner, information regarding the conditions of your chimney, including the flue lining, can be supplied by a Wertz & Co Inc. NFI Certified Chimney Sweep. Although codes and building practices may vary form one stat or locality to another, the installation of the lining in chimneys has been recommended since the early part of this century. It should be noted that many chimneys built since then have not included a flue lining. The most common material used as a lining for masonry chimneys in a new construction is terra-cotta clay flue tile. It is an inexpensive and easily obtainable product. Lining products made of other materials, such as ceramics, metal, and cast concrete, are preferred and may also be used in new construction. These alternatives are most commonly used in upgrading chimneys built with improper linings, those with damaged or oversized linings, or those originally built without the benefit of any type lining. In the 1940s and 1980s masonry chimneys were tested by the National Bureau of Standards (NBS) for durability due to rising concerns about their performance and safety. These tests involved lined (using clay tiles) and unlined chimneys. Below are the published results. 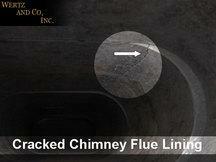 Unlined chimneys allow heat to move through brick chimney walls very quickly. The unlined test chimney caused adjacent woodwork to catch fire after 3 hours of testing. In fact, the unlined chimney performed so poorly that testing of unlined chimneys was abandoned. Clay flue tiles were easily damaged during the testing as a result of thermal shock. All flue tile samples subjected to the heat shock test suffered damage in the form of cracking. It was determined that if the flue gases were allowed to penetrate to the brick and mortar, the result would be a reduction in the usable life of these components due to mortar deterioration. It is important to note that flue gases are acidic in nature and can be quite corrosive. At the conclusion of the testing, the researchers recommended that flue linings, and the bon ding material that join s them, be capable of containing flue gases and be designed to minimize condensation in the system. In fact, the researchers felt so strongly about the need for proper lining that they characterized building a chimney without a lining as little less than criminal. During the testing, it has been consistently shown that clay tiles crack quite easily from thermal shock. Testing has also shown that clay tile does not crack from normal usage. Clay tile is a ceramic product and as such it cannot rapidly absorb and evenly distribute heat during rapid temperature rises in the chimney. A rapid temperature rise (as during a chimney fire) will cause the clay material to rise in temperature much more rapidly on the inside than on the outside of the tile. As the inside heats up, it will begin to expand very rapidly, much more rapidly than the cooler outside is expanding. This uneven heating produces an unequal expansion which in turn causes the flue tiles to crack and split apart. This is similar to immersing a cold drinking glass in very hot water. It will shatter instantly. Thermal shock results only during periods of rapid temperature rise or fall, or when starting a hot fire in a cold chimney. These conditions are met almost solely during what is known as a chimney fire, or when water is introduced during a fire, rapidly cooling the tile. A chimney fire is defined as combustion within the venting system of an appliance. A venting system will include the flue, the connector pipe of a heating appliance, the thimble area (the point where the connector pipe passes into the chimney), and the smoke chamber of a fireplace (the area between the firebox and the flue). None of these areas were designed nor intended to accommodate combustion. Combustion in these areas causes temperatures to rise and heat the surrounding chimney structure quite rapidly. During a chimney fire, the flue gas temperature may well approach and at times even exceed 2000 degrees Fahrenheit. This is more than enough to produce thermal shock and crack the flue tile. A chimney fire may either be free-burning or may be classified as slow-burning. A free-burning chimney fire is what normally comes to mind when we hear the phrase chimney fire. Free burning chimney fires are usually noisy and dramatic enough to be detected by the home occupants or by passer-by. These fires usually cause rumbling noises from the chimney, a tinkling sound from the connector pipe, and have even been compared to the roar of a large jet aircraft flying in the vicinity. Flames may be observed coming from the top of the chimney, and at times a virtual fireworks show will occur, often drawing the attention of neighbors. A slow-burning chimney fire, on the other hand, does not always exhibit the sights and sounds commonly associated with a chimney fire. This fire burns slowly because the supply of oxygen or fuel in the venting system is limited. 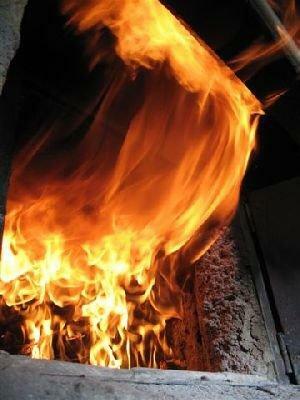 A slow-burning fire is potentially more damaging to the chimney and surrounding combustibles than a free-burning fire because the areas where they occur are not venting freely. This lack of ventilation holds down the obvious signs of the fire while contributing to rapid heat build-up in the chimney. Ashes from burned creosote are usually present after a chimney fire has occurred. Creosote ash will be light-weight and fragile, with a tissue paper-like consistency. Often the creosote will exhibit many colors. Clean areas may appear randomly in the flue. These clean areas are the result of extremely high heat build-up or possible air leakage into the chimney. Metal chimney components such as dampers, chimney caps, or metal smoke chambers may be warped and / or discolored. Antennas mounted near the chimney may also be damaged. Large pieces of expanded, creosote may be found in gutters or the yard around the chimney. There may also be damage to the roof around the chimney. It is not unusual for the occupants of a home to be completely unaware that a chimney fire has occurred. Chimney sweeps find numerous cases where undetected chimney fires have occurred. Chimney fires may also occur while the occupants of the home are either asleep or away from the home. A masonry chimney expands and contracts, as it heats and cools. This may cause pieces of a cracked flue lining to fall out. As a result, the chimney becomes unlined in these areas and presents all the hazards of an unlined chimney. Fallen pieces can also block the flue and cause flue gases to back up into the appliance and the home. Flue gases can leak during use of the heating system. One of the primary functions of the flue lining is to contain these products of combustion. When a flue lining is cracked, these cracks open during the heating phase and may allow gases to pass to the chimney walls. These gases, being acidic, attack the masonry and will shorten the life of the masonry structure. In addition this can lead to carbon monoxide in the residence. Heat can be transferred to the vulnerable chimney walls. One of the important functions of the flue lining is to serve as an insulator between the hot flue gases and the chimney wall. When chimney walls are overheated, this heat can also transfer to surrounding combustibles. Never use a chimney that does not have a liner or that has a damaged or improper lining! Your chimney is an important part of your home heating system. For safe and efficient operation, your chimney should be checked annually by a NFI Certified Chimney Sweep and cleaned as needed. Each year, unsafe chimneys cause significant numbers of deaths and injuries. And it has accounted for more than $200 million in property losses. Make chimney examinations a regular part of your home maintenance schedule. Dont become a statistic! Call Wertz & Co Inc. NFI Certified Chimney Sweep professional at (302) 658-5186.